At the school where I work, there is quite the incidence of students of students with childhood apraxia of speech and severe phonological delays in Kindergarten and first grade. It is hard to find applications at the right level for each student in particular because some students prefer real-life images and text to animated or illustrated images, even if I am working with a group of students. This can be frustrating as what they really need to work on is the content regardless of context. Therefore, I try to motivate my students in whichever way works the best whether its flashcards, real-life images, an animated application, cues, etc. 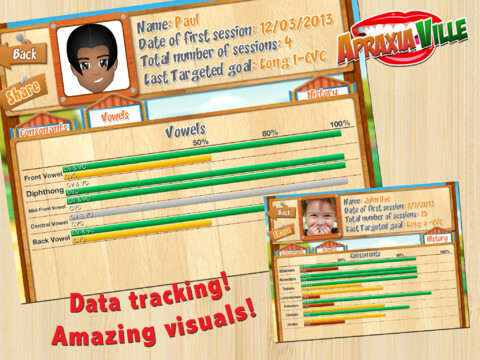 Apraxia Ville has definitely been a motivating application for my students who prefer animated and illustrated images or need an animated cue of mouth movement on an age-appropriate model instead of staring at my face all of the time. 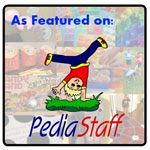 For more information about Apraxia Ville and its use, continue reading. The Main Page of the application has five buttons for different menus - Quick Play, Select Player, Reports and Prizes, Support, and More Games. Backup iTunes - This will back up application data to iTunes for the ability to restore at any time. Facebook - Brings you to Smarty Ears' Facebook page. Contact Smarty Ears - Pressing this brings you to the Mail application so that you may e-mail Smarty Ears for support with the application. Pressing the "More Games" button will bring you to a list of Smarty Ears' iTunes applications to view which additional apps they have for sale and more information about them. Pressing on an application you are interested in will bring you to that app in the iTunes store. To begin application play, press the "Select Player" button. Make sure you add a student to the application prior to application play by pressing the "New Player" button. Pressing on the blank square that states "Select Picture" will allow the user to choose an avatar, take a photo, or choose a photo from the camera roll to associate with their profile. Then, press within the rectangle below the "Enter Name" text to type via the keyboard. Press "Done" to add the user to the list of player profiles. You can edit profiles later by double tapping on the user's photo. Another way to add user profiles is through importing them via the free Therapy Report Center (TRC) application by Smarty Ears. By pressing this button in the lower left hand corner, you must have the Therapy Report Center application installed already on your iPad. 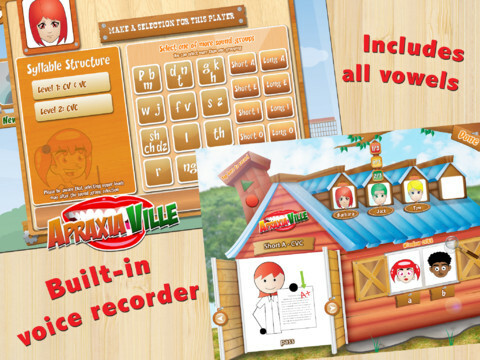 You will be brought to the TRC app to choose a student profile to export into Apraxia Ville. After it has begun importing, return to the Apraxia Ville application. To learn more about Therapy Report Center, visit smartyearsapps.com. Next, you may choose up to four players to use the application at a time. Tap on the profile image(s) of the student(s) you wish to play. A green check mark will appear in the right hand corner of those you choose. There is also a "Settings" button in which you can press the "Modify Word Pool" button in the pop-up menu to choose specific words that can be worked on in the application or create a new image/word combination. This will be discussed later in the review. Once you have chosen the users to play the application, press "Next". A pop-up menu will appear with three activity choices for you to choose between - The Sound Windows, The Farm House, and The Words Farm. You can view more information about each activity by pressing the "i" button in the top right hand corner of the "Choose The Activity" pop-up window. This activity practices individual phoneme production with visual cues. Press on "The Sound Windows" button to choose this activity. This is for students who are working on phonemes in isolation or in CV words. The first window shows a boy and you can choose a consonant to practice. The second window shows a girl and you can choose a vowel to practice. Press the consonant or vowel itself to view a pop up scroll menu with other consonants or vowels to choose from. Choose the consonant or vowel you want the student to practice. Press the boy or girl's image to view an animation of him or her producing the sound. You will see his or her mouth move in the particular shape of the sound. Press the image a second time to pause the animation. The pepper will move across the line to show at what point the animation is at in its play. If the user would like to view himself or herself making the particular consonant or vowel sound, press the camera button next to the consonant or vowel title. Another great feature within "The Sound Windows" is the fact that the user can press the camera button over the consonant or vowel sound window to cause the front camera to turn on so that he or she can practice his or her sounds as if he or she were looking in a mirror. You can select more than one grouping for the student as well or tap at the bottom of the screen to use previous settings for the individual. These groupings are disabled for multi-syllabic words. Once you have chosen the syllable structure and sound groups to practice for each student, press the "Next" button which will bring you to the activity. You will see an image of a word in the main doors of the barn with its text below the image. Images are Smarty Ears' own Smarty Symbols graphic art which are used in many other applications including their AAC application Expressive. Above the image, the sound and syllable structure will show. The record button is located on the chimney of the barn which allows the user the opportunity to record each word and play it back by pressing the green play button. The user who is to practice the sounds/word will show a red, yellow, and green button above his or her name/image. Press the green button if the student stated the sounds correctly, yellow if it was approximate, and red if they were produced incorrectly. As you score the students' sound productions, the numbers of correct/approximate/incorrect responses will adjust as fractions. Switch between users by pressing on their different images. Whichever student you select will have the three buttons to record accuracy above them. If you stick with the same user or are only working with one user on his or her own, press the arrow buttons to move between words on the barn doors. Another option to use within The Farm House activity is the window cues. These are the same as from The Sound Windows activity except smaller and without a time bar. You can choose which sounds to use as cues in the windows by pressing on the signs with a consonant or vowel and choosing the one you want on the scroll wheel. Then, press on the girl's or boy's image to see the animation and hear the sound of the phoneme chosen. 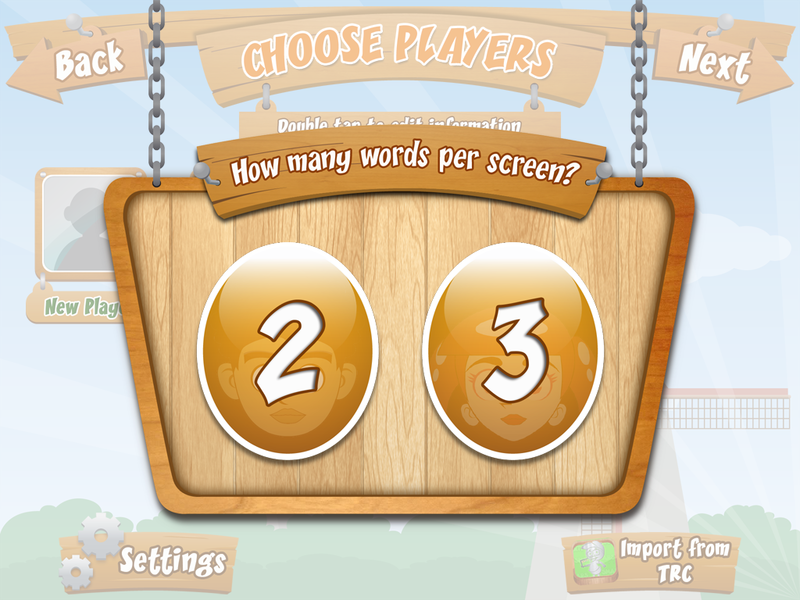 Once you select this activity, you must choose how many words you want shown on the screen between 2 or 3. After that, the activity will appear with two or three word wheels with images/text depending on how many words you chose there to be. Choose which phoneme you would like each wheel to work on by pressing the top phoneme button and syllable structure by pressing the bottom button. This activity practices words in sequence. To hear the word sequence stated aloud, press the green triangular play button. To hear one individual word, press its image. To switch words, swipe up or down to scroll on the word's wheel. The user who is to practice the sounds/word will show a red, yellow, and green button above his or her name/image. Press the green button if the student stated the sounds correctly, yellow if it was approximate, and red if they were produced incorrectly. As you score the students' sound productions, the numbers of correct/approximate/incorrect responses will adjust as fractions. Switch between users by pressing the arrow button next to the users' image. You can have the user record his or her productions by pressing the red record button and hear them played back by pressing the green triangular button on the right hand side of the screen. Pressing the "Quick Play" button will allow the user to choose one of the three activities described above (The Sound Windows, The Farm House, or The Words Farm) as a single user without the ability to save the data to a user profile. You can still choose the sounds/words to be used like regular application play, except for you cannot modify the word pool. You can also score the students' responses and receive a report to share after the activity has been completed, but it will not be saved to the application. To modify the word pool used with your students or add additional words, press the "Settings" button at the bottom of the screen on the "Choose Players" page. You will then see lists of words categorized by sound on the left as well as syllableness at the top of the screen. To scroll through the list of sound groups, swipe up or down on the left hand side of the screen. To choose a syllable structure, just press one of the buttons at the top of the screen or scroll down on the left hand side to view multi-syllabic word options. If there is a certain word you do not want to use due to cultural, individual, or level of difficulty considerations, find the sound group and syllableness that the word is in and then uncheck it. Each word is shown with its image, sound, and syllable structure on the right hand side of the page in a list. You can even choose to "Deselect All" words and only check which ones you wish to use for a particular sound group by tapping on them which will show a green check mark if used. To create your own words, press the "Edit" button on the top right hand side of the page. Then, press the "+" button in the top left hand side of the page. A screen will appear with the title "Add Custom Images". Decide what word you want to add, then tap the square on the sign to add an image associated with the word from the camera roll. Then, type the word below the image via the keyboard. Then, record the word by pressing the red circular "record" button. Press the green triangular "play" button to hear it played back. Next, select the syllable structure associated with the word by pressing within one of the square boxes. After that, choose whether the word focuses on a vowel or consonant. Finally, choose the phoneme associated with the word via a scroll wheel and press the "Add" button to add the word to your Custom Words list. You can access the "Reports and Homework" page following an activity or from the Main Page. Press the image of the user whose data you wish to view. You will then be shown the user's data with the user's name, date of first session, total number of sessions, and last targeted goal at the top of the screen. Below that information is information with tabs at the top to view specific data for consonants, vowels, syllable structure, or history in general. Consonants - View progress via a bar graph of overall average progress on consonants from application practice. Consonants are categorized by place within the mouth (alveolar, labiodental, etc.). Bars on the graph are shown over the syllable structure they were practiced in on a scale of 0-100%. Vowels - View progress via a bar graph of overall average progress on vowels from application practice. Vowels are categorized by place within the mouth (central, front, back, etc.). Bars on the graph are shown over the syllable structure they were practiced in on a scale of 0-100%. History - Pressing this tab will show history for each individual session. Information shown includes the date of the session, duration of the session, number of participants, activity, target phonemes practiced, syllable structure practiced, and accuracy divided into correct, almost, missed, and an overall percentage. Any of these graphs or history can be shared to e-mail, save, or print by pressing the "Share" button. 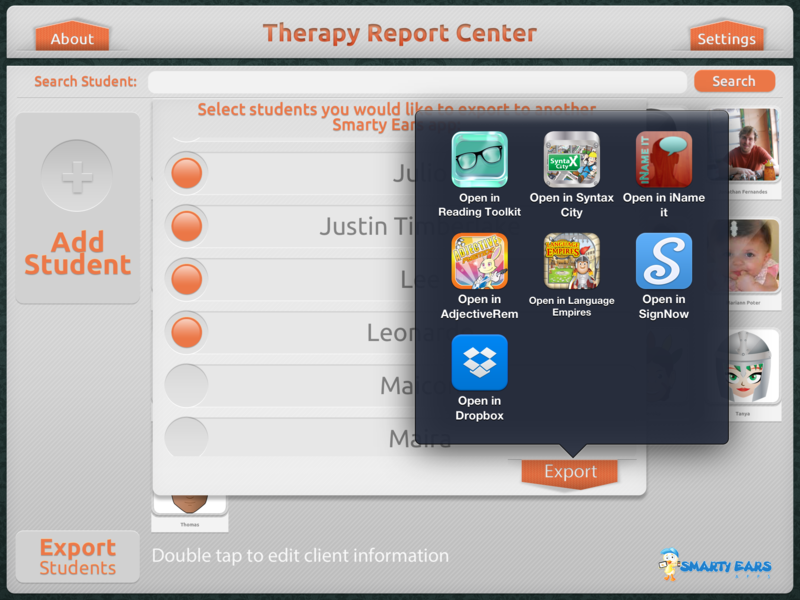 Then choose to open the data in the Therapy Report Center from Smarty Ears or Skitch, Mail, Print, Copy, iBooks, or Google Drive app. Just make sure you have the application you choose to open it in installed with the appropriate permissions and WiFi/3G/4G enabled if needed. Follow the directions of the other application to share the data. To choose a homework page to send home with a student, press the "Homework" sign at the top right hand side of the "Reports & Homework" page. A pop-up window will appear to ask which homework file you want to display. Choose the phoneme to practice on the left hand side and scroll the list to find the phoneme by swiping up/down. Press the square next to the phoneme to place a pepper in the box showing it is selected. Then, choose the syllable structure you want the child to practice the sound in on the right hand side of the window. Press the box next to the syllable structure to select it and have a pepper appear in the box. Finally press the "Open" button once both have been selected correctly. A pre-created homework page will pop-up with blanks for the student name and date followed by the sound and syllable structure being automatically filled in. Words and their corresponding images appear in boxes on each homework page. There may be multiple pages for your sound/syllable structure. You can then share the pages by pressing the "Share" button at the top right hand corner of the application. Either open the homework pages in one of the following apps - Skitch, Mail, Print, Copy, iBooks, or Google Drive - or have the Mail or Print pop-up window appear. Then, all you have to do is send it on home with your student! There are three different motivating activities to play. The entire application has a farm theme with windows, pages, backgrounds, activities, buttons, and more staying within the theme. You can customize the application to fit your clients' needs by adding words relevant to his or her everyday life to practice. Being able to view animations of children's faces as they make different sounds in "The Sound Windows" and being able to slide to different spots within a sound or digraph makes the application more relatable and focuses the user on correct placement of sounds. There are so many different levels to practice sounds at which makes the application perfect to use with students at different levels of practice from phonemes in isolation to four syllable words! 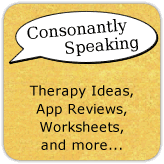 Sound sequencing between words is not an aspect that many apraxia applications take into consideration which makes this application more desireable to the consumer. The fact that homework has already been prepared for the speech-language pathologist to print and send home reduces the amount of time spent trying to find appropriate homework. I absolutely love the different bar graphs showing specific information about the client's practice on the application! It makes life a lot easier! It is phonemenal that the user can switch between animations of characters stating different sounds and use of the front facing camera for the user to practice making his or her sounds with correct articulatory placement! A couple of the animations of mouth movement for "The Sound Windows" seem a tad bit off. For the /f/ sound, the teeth are not shown on the child's lip and the /s/ sound should have the child's lips/teeth be a bit more elongated and unrounded (not a huge difference between the /s/ and /sh/). It took me a while to figure out how to add my own images/words to the list because I wasn't aware that pressing the "Edit" then the "+" button was for that function. I think I figured that "Edit" was to delete words or change the images for the pictures already pre-installed. It might be nice to have this option a little less hidden. 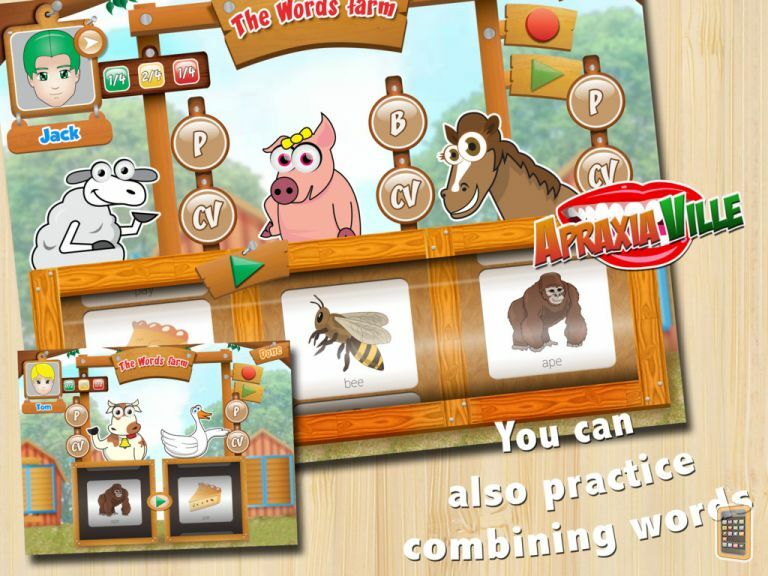 Apraxia of Speech: This application is intended to be used with students who have apraxia of speech. See all of my notes above as to how to use the application with these students. 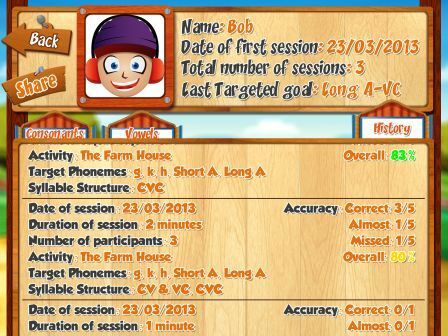 Articulation: Choose the students' articulation sound to focus on in "The Farm House" activity. You can also choose the syllable structure to practice the sound in or to practice sounds in blends by choosing the CCVC syllable structure in "The Farm House" activity as well. If the student is working at the phoneme level, "The Sound Windows" activity is perfect for that student. Fluency: If there are specific sounds that are difficult for a student with a fluency disorder to produce, you can choose that sound to focus on beginning of the word in "The Farm House" activity. 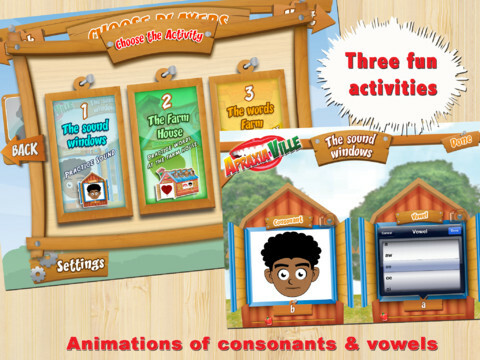 Use techniques such as easy onset with various consonant/vowel combinations in "The Sound Windows" or "The Farm House" activities. In addition, if a student is having difficulty producing multisyllabic words or word sequences, use "The Farm House" or "The Words Farm" activity. 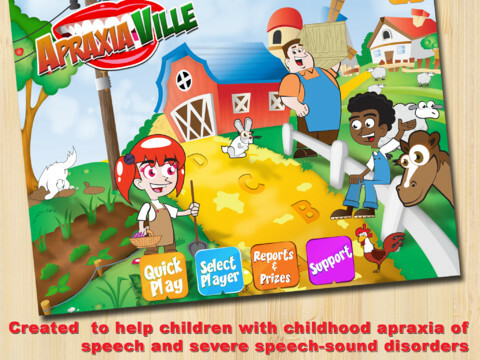 Apraxia Ville is available on the iPad for $29.99. The author of Consonantly Speaking was offered an application code of this application for review. No other form of compensation was received.